Disclosure: This event was hosted by Lionsgate, but all thoughts and opinions are my own. Recently, I attended a fun My Little Pony themed party at Duff’s Cakemix in Pasadena to celebrate the digital release of My Little Pony: The Movie – which is now available today! Duff’s Cakemix was the perfect setting – at the location, you can custom decorate cakes from the fondant to the toppings, the whole look of the bakery was incredible colorful (just like the ponies in Ponyville). There were of course cakes and cupcakes themed to My Little Pony, and little pony figurines on the table that the kids could use for cupcake toppers to complete their cupcake creations. The fandom for My Little Pony has grown so much that we now have My Little Pony: The Movie. With one of Strong’s favorite things about the movie being the introduction of sea ponies! (I quite loved that scene too, fun music and an under the sea look, and a new pony world to explore!) 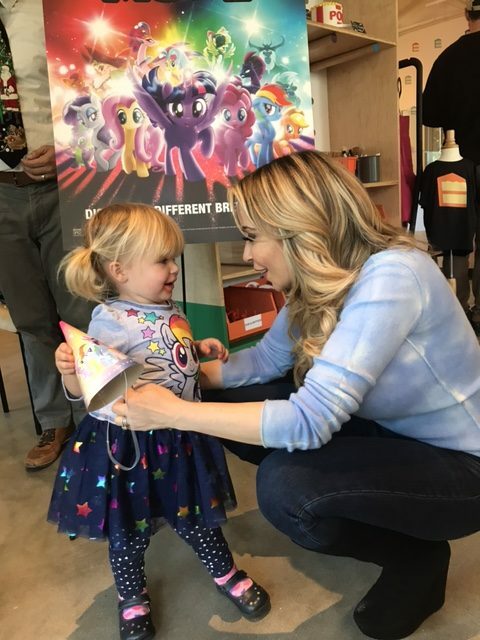 After the interview with Tara Strong, she said hello to the kids at the party and would even talk in Twilight’s voice (the kids got very excited to meet the real Twilight Sparkle). My daughter absolutely loved meeting her, and showing off her Rainbow Dash dress to her! Ever since we left the party, my daughter has been wanting to listen to and sing along to the My Little Pony: The Movie soundtrack (the songs are incredible). We are so excited My Little Pony: The Movie is now out on digital, and on Blu-Ray Combo pack, DVD, and On Demand January 9th!